If you love PBS programming such as my family does, then you'll want to download the new PBS streaming video app for iPhone. The free app offers more than 300 videos from 30 shows, including full-length episodes, segments and previews with new content updated daily. 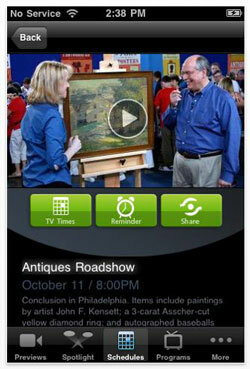 Shows from some of PBS' most popular series are available, including: Antiques Roadshow, Great Performances, History Detectives, Julia Child, Nature, NOVA, and Secrets of the Dead. While not all of the shows have full episodes available (PBS Kids is notably lacking), most have at least a handful. And some, like Julia Child's Cooking with Master Chefs series from the 1990's, are a real treasure. My favorite is the episode with a pre-celebrity Emeril Lagasse looking downright trim while cooking a classic shrimp etouffee. The PBS app also lets you look up when future episodes will be airing on your local cable channel and set up reminders in your iCal calendar app. The PBS app is available through iTunes, and there is a similar app for iPad, as well.